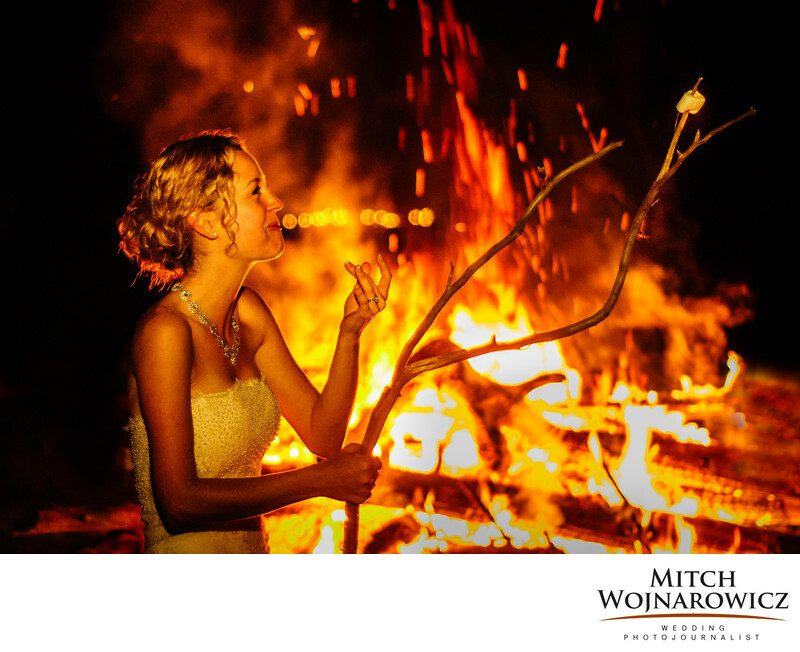 Adirondack Wedding Bonfire..As an Adirondack wedding photographer, I watched as Jen enjoyed a laugh late in the evening as she was roasting marshmallows at a huge wedding day bonfire during a reception at Camp Nawita on Paradox Lake in the Adirondack Mountains of New York...In the warm light of the evening summertime wedding with the huge orange flames of the bonfire behind her, our bride spends time visiting with family and friends as the wedding reception winds down. ..I moved away at this time, shooting from a bit of a distance so the quiet exchanges of the family and friends could take place. And the natural feelings and emotions could come out. Working from a distance with high speed lenses and a camera set to a very high sensitivity, I was able to pull in lots of natural light. And with a flash wrapped in a restrictive light modifier, and powered way, way down, I placed the slightest bit on light, all but unnoticeable to everyone in the dark, on our bride to pop her out from the flames. The result is a very natural image, one which looks like natural light photography, but in the end is so much better...And captured forever is a simple wedding moment, showing wedding photojournalism at its best. Keywords: adirondack (60), paradox lake (3).